Investigator Patrick Flynn told me on the phone when he was closing out my case that 1. My therapist denied everything so it was “he said she said” and 2. ‘We don’t look into the AA thing’. So, after three attempts at getting New York State to acknowledge a very serious problem with two-hatting therapists over the course of two years, this has always been and is still their official position, regardless of how it is clearly willful negligence. – Treatment coercion is illegal. When networks of people are coached to impose ‘consequences’ for not entering treatment, it’s still coercion even if you say it’s not. It may even be a form of insurance fraud. 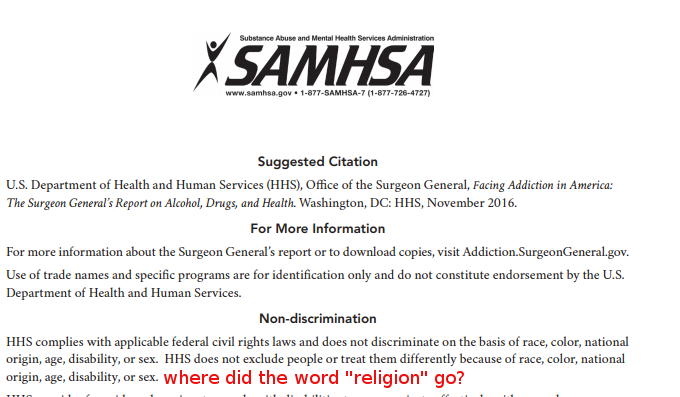 – Religious indoctrination into AA is a First Amendment violation, as well as a bad treatment for most conditions. It is ineffective and should not be protected from malpractice and fraud complaints. – The 12-step treatment industry is psychologically abusive and extortionist in its approach. This is verifiable and not up for debate. ‘Treatment’ is life-and-death necessity until it fails or it’s questioned, and then suddenly “AA isn’t treatment”. Finally, other abuses are easily hidden under the guise of ‘help’ in a 12-step organization, and also often arise out of the confusion that 12-step programs create. It is not necessary to lie to your clients, seduce them, or punish them to ‘motivate change’. The ‘unforced forces’ of better arguments have their own power. In my opinion, it should be standard practice for New York State Education Department to inform therapists accused of 12-step coercion that this is not acceptable for a variety of reasons and they are being warned and will face consequences to their license status if new complaints arise. It’s the f*cking EDUCATION department; they need to be setting some standards for basic knowledge about treatment options.